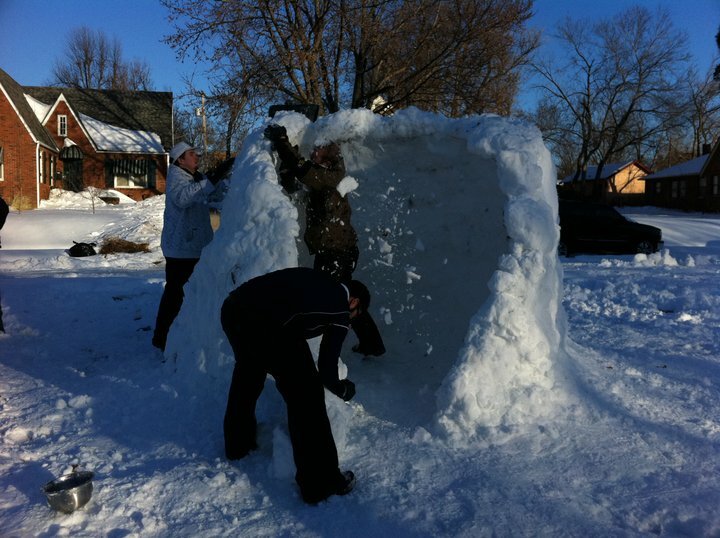 What is better than 10 adults building an igloo? That’s right, nothing. Getting taller now…making sure the walls will support the roof! All done! Our igloo was warm and even equipped with delicious smelling candles! Whoa, being snowed in for seven days has been….well, interesting. It is amazing how much my motivation went out the window when you don’t have a car and you can’t leave your house without wadding through 14 inches of snow! And don’t forget people, we live in OKLAHOMA. 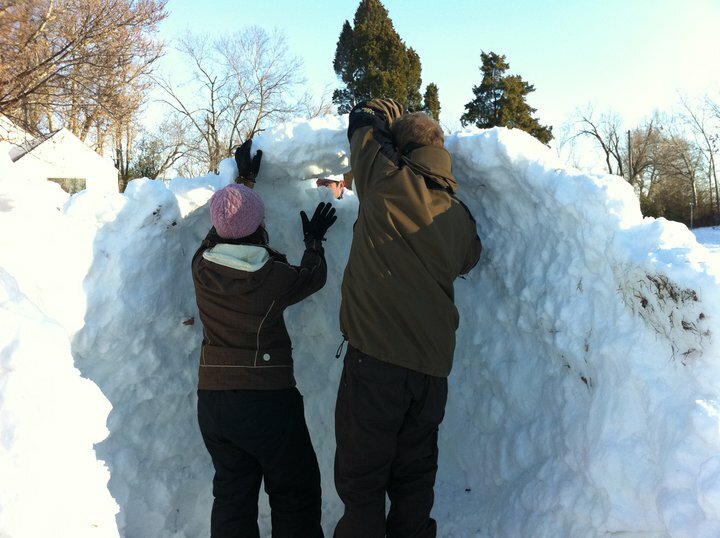 This much snow is a record for our state. Usually we are lucky if we get 3-4 inches in one sitting here in T-Town, but 14? Sheesh. They were actually calling it The Snowcalypse of 2011! Cars were littered all over the street, buses were stuck blocking entire intersections and most grocery store shelves were completely picked clean. Fortunately, we were able to get out one day (when the temp was above negative 6 degrees) and have a little fun. 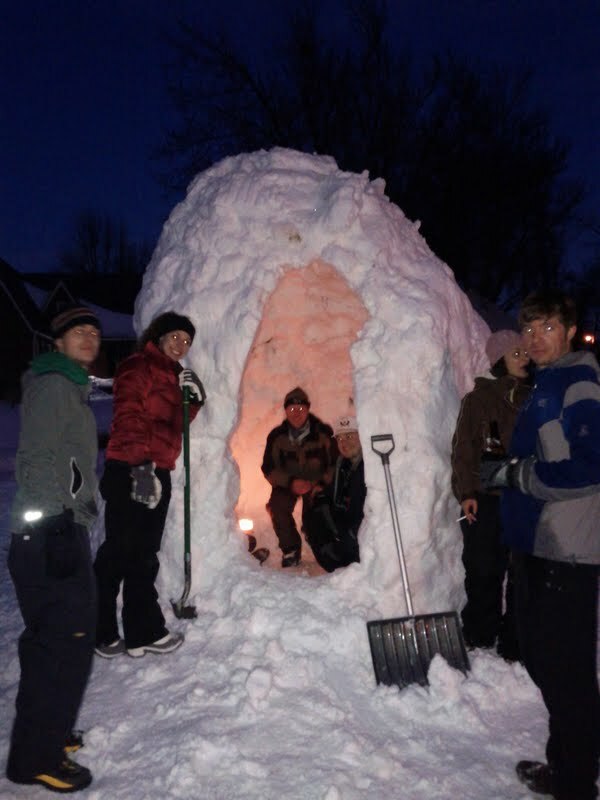 As you can see by the 10 foot tall igloo in the picture above…we had a blast. Which brings me to the theme of today. Even when the weather isn’t perfect, or cooperating at all, you are stuck inside due to a blizzard, or any other natural disaster that could be messing up your days there are always ways to stay active and keep your body going. 1. Shovel your driveway, and the neighbors (if they deserve it). If you have a weight vest, even better! Strap that baby on and see how fast you can get it done. 2. Have a massive snow ball fight. It could be with your kids, neighbors, friends, whatever. Nothing gets your heart beating more than running from or chasing someone with an arsenal of snowballs. Talk about a good time. 4. Do a few WODs in your house. Not all workouts need weights, you can do a great workout with nothing but your body. 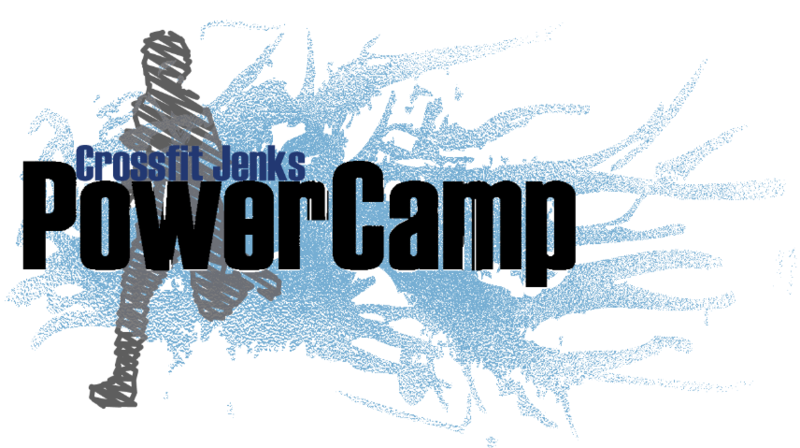 Try: 10 rounds – 10 burpees (click here to see how a burpee is done) and 20 sit-ups. Time yourself and see how fast you can get it done. 5. Rocky it up! Pile on the clothes and try for a neighborhood 5K. (make sure you have some nice sweat pants for your attire to really get you in the mood. So there you have it. 5 fun ways to stay active when the weather tries to keep you in. Check back soon because I will be posting my the results of my Snowy Paleo Muffins! Stay Active, Stay Healthy, Stay Warm, and smile!